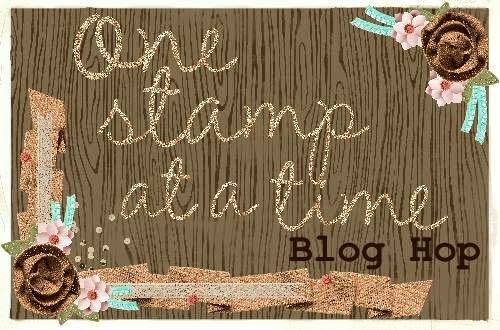 Hello and welcome to One Stamp At A Time's May Flowers Blog Hop! I was so excited when I heard we were going with a May flowers theme! I have some new pre-order goodies from Stampin' Up! that I was excited to use! If you've already been hopping, you should have landed from my friend, Andrea Tracy-Tucker's blog! I've already had a sneak peak and know that she really outdid herself this time! If you missed it, you'll want to be sure to check her fabulousness! I was super excited to get to use my new "Pop Of Pink" Specialty Designer Series Paper, "Swirly Scribbles" Thinlits Dies, and "Thoughtful Banners" Stamp Set and coordinating Duet Banner Punch. My card started out with an 11" x 4 1/4" piece of Melon Mambo cardstock that was scored at 5 1/2". I added a 4 1/8" x 5 3/8" piece of Basic Black cardstock for that thin layer look that I've been into lately. My top layer is a piece of the Pop of Pink Specialty DSP that measured 4" x 5 1/4". I cut a large Swirly Circle of Basic Black and adhered it with a Fine-Tip Glue Pen. I added a Banner of the reverse side of the Pop of Pink Specialty DSP, adhered with Fast Fuse. I stamped Happy Birthday from the Thoughtful Banners stamp set with Memento Tuxedo Black onto Whisper White and then cut banner ends on it and attached over the DSP banner. 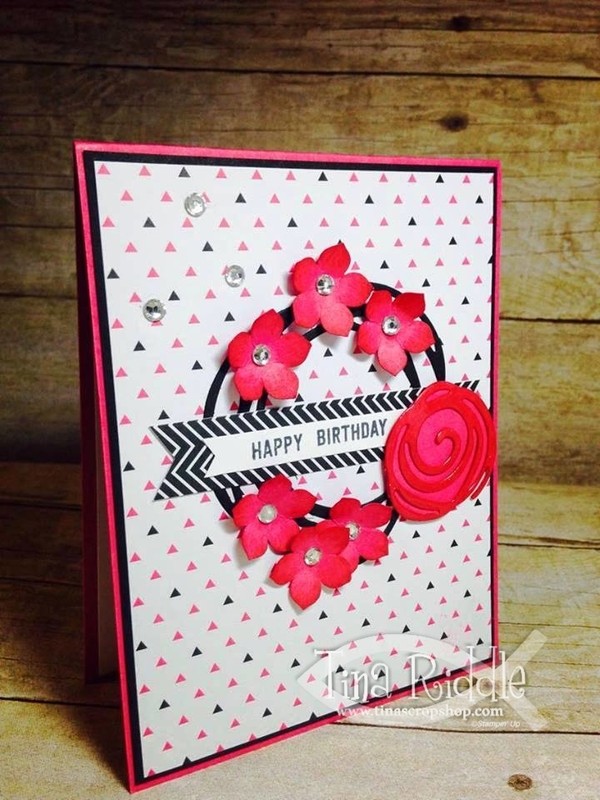 My Swirly Flower was cut in Melon Mambo Cardstock. I rubbed the top of it in Versamark Ink and then heat embossed with clear embossing powder. I attached it to a piece of Melon Mambo Cardstock. I think the embossed swirl really pops over the same cardstock that is not embossed. The Swirly Flower was then attached with Dimensionals. I punched out some flowers with the Petite Petals Punch in Melon Mambo cardstock and sponged the edges tone-on-tone. They were attached onto the Black Swirly Circle with glue dots. A Rhinestone was added to the center of all of the Petite Petals flowers. I also added three Rhinestones in the upper left of my card. This one is a mixture of the new, the returning, and the soon to be retired. The new of course is the Pop of Pink Specialty DSP, Swirly Scribbles Thinlits Dies, the Banner Duet Punch and Thoughtful Banners stamp set. The returning is the Curvy Keepsake Box Thinlits and I promise if you don't have this one.. you NEED it! 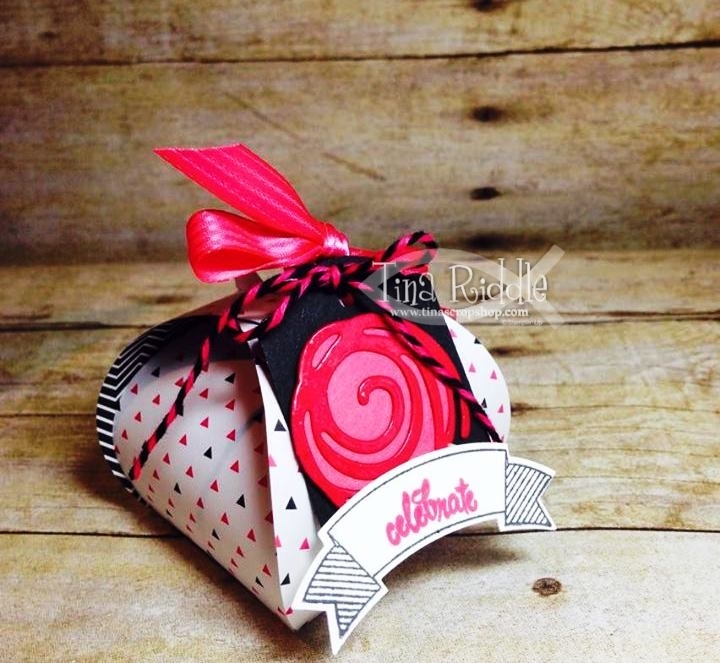 I have used these dies soooo many times and have loved every Curvy box I've made! The soon-to-be retiring is the Note Tag Punch, as well as the Melon Mambo Stitched Satin Ribbon, and Melon Mambo and Black Twine. I love this twine so much.. so here is where I insert a sad face :( ! Next up on this awesome hop is Renee Ondrajka! I'm sure she has outdone herself.. as always! Just click the next button and you'll be there! In case you've lost your way.. here is a list of all of our Talented Hoppers this month! Such a fun mix of new and retiring! Love the pop of pink! Cute creations Tina! Thanks Holly! I am loving this Pop of Pink DSP! Love!! 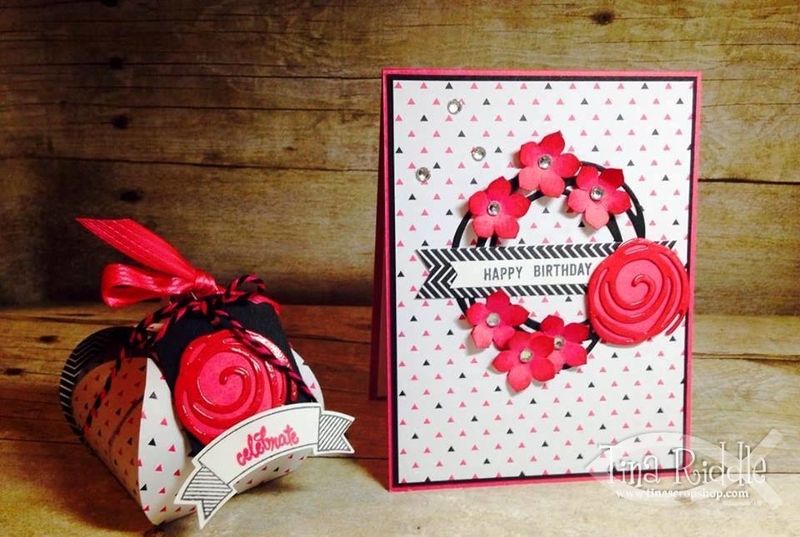 Your color combo is awesome and I cannot wait to get my hands on those Swirly Scribble Thinlits!! I love your mix of old and new! Your card is exactly my style! I'll have to CASE it for sure! Love them. Colors are so happy. Great job. Thanks :) It's such a fun die set for sure! I ordered this paper and bundle too! Love it! New products, so exciting! I absolutely love those swirly flowers! Tina...love the Melon Mambo! That is one of my favorite springy colors! As always I love your projects! Love your projects Tina! I didn't order the Pop of Pink, but you're making me regret that. These projects are just so awesome!!!! Love the colors. Great job! Cute! Love the Melon Mambo & Black together!